Did you know that nowadays original Balsamic Vinegar of Modena PGI is sold in more than 120 countries around the world and it’s among the top 10 Italian PDO and PGI food specialties? It is a great business, it is worth around €60 billion in North America, which is almost half of the entire Italian Food Industry profit. Unfortunately, being recognized all over the world has brought also to the unceasing imitation of the original product: in fact, the frauds claims to have the original products just adding the word “balsamic” on the package. di Modena” that is promoting a session entitled “BALSAMIC VINEGAR OF MODENA, THE ORIGINAL – Protected Geographical Indication from Europe” at IFBC17. During this session a series of information and notions are given to the guests, such as that the area of production of Balsamic Vinegar of Modena PGI is the provinces of Modena and Reggio Emilia. Modena has even conquered the UNESCO World Heritage list with its Piazza Grande, Modena Cathedral and Ghirlandina Bell Tower, that fascinates people from all over the world. What is the secret that makes Balsamic Vinegar of Modena PGI the fine dressing has we know today? Three are the main elements: Grapes only local vines can be used, such as Trebbiano and Lambrusco, as well as smaller grapes such as Sauvignon, Sgavetta, Berzemino and Occhio di Gatta. Earth, only the territories of Modena and Reggio Emilia and finally Love. 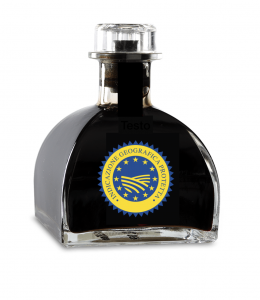 What are the typical characteristics of Balsamic Vinegar of Modena PGI? The packaging has the words original Aceto Balsamico di Modena, together with the Protected Designation of Origin logo. Moreover, if it has the word “Aged” it means that it has aged at least three years. Also, producers associated with the Protection Consortium are allowed to display the Consortium logo on the label. In addition the PGI logo helps us to understand which one is the original product and which one is the forged one. Previous Use Balsamic Vinegar: more than a salad dresser!